DFW Weather: Will it rain for the start of the State Fair of Texas? Yes, more rain is possible this week during mainly the second half of the week. But the good news is that it looks to be in the form of scattered showers or storms, NOT widespread flooding rain. There could be heavy rain under t-storms, but that would be isolated. 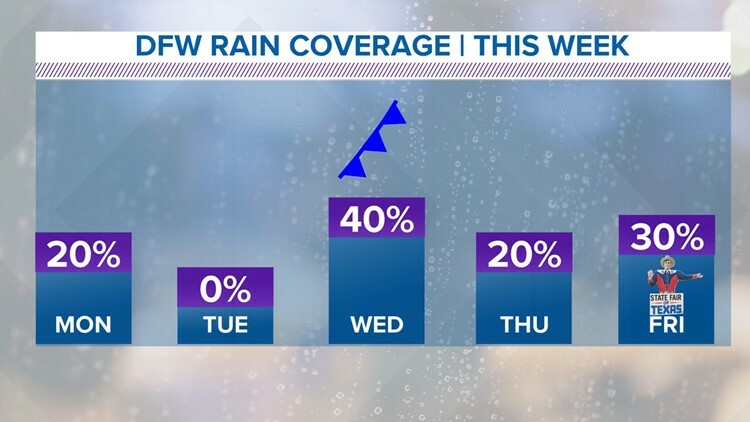 From #WFAAWeather: Besides some morning fog and drizzle, the next couple of days will be mainly dry. A cold front arrives on Wednesday bringing scattered showers and storms. Scattered activity continues into the weekend, but not looking like a washout for the State Fair of Texas! The good news is that the rain looks to be in the form of scattered showers or storms, NOT widespread flooding rain. There could be heavy rain under T-storms, but that would be isolated. Yes, more rain is possible this week during mainly the second half of the week. MONDAY: Cloudy morning with some afternoon sun. Isolated shower or storm (20%). Winds: S 5-10. High: 81. MONDAY NIGHT: Partly cloudy and mild. Winds: S 5-10. Low: 70. TUESDAY: Partly cloudy and warmer. Winds: S 5-10. High: 89. Speaking of the State Fair of Texas, outrageous State Fair food concoctions are a wonderful thing about fall in Texas. This year, we decided to have a little fun with it... Check out our Facebook post and find out what tasty State Fair treat you are by using a few facts about yourself.